Nothing beats the summer heat like a blast of cool air from the air conditioner. If you want to enjoy low temperatures without the high electricity bills, split system air conditioning could be the best option. What are the advantages of using split system air conditioning? These efficient heating and cooling systems come in all sizes, whether you need to cool a single room or a larger space in your home or office. 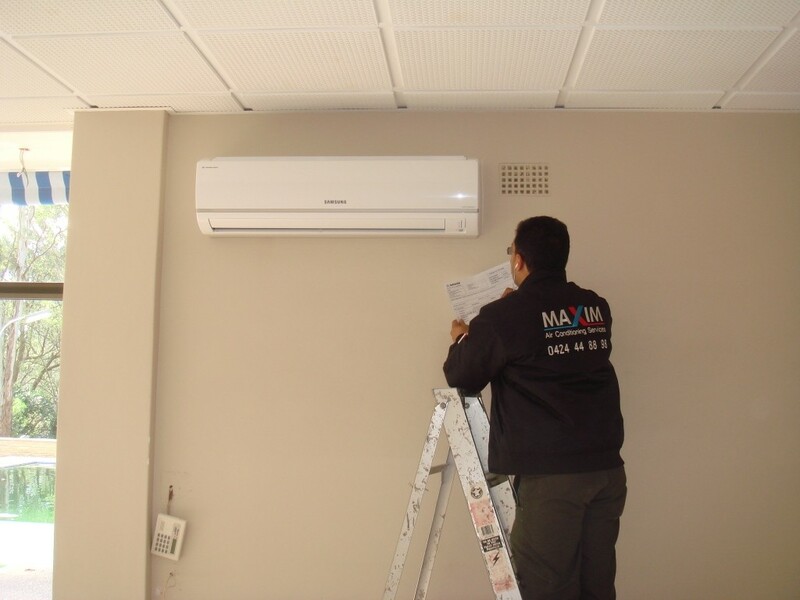 Maxim installs quality split systems from the most trusted brands in Australia at competitive prices including Daikin, Samsung and Mitsubishi Electric. We have more than 15 years of experience working with all types of cooling and heating systems for residential homes and commercial buildings, offering the highest standard of service at competitive prices in North Shore and Castle Hill in the Hills District of Sydney NSW and across Sydney. Rapid cooling – These systems cool spaces quickly and efficiently, with automatic timers and remote control operation making them convenient to use. Energy Saving – Inverter technology means less energy is needed to maintain a consistant temperature. All the split systems we install meet or exceed the Australian Minimum Energy Performance Standard (MEPS). Saving money – As well as lowering your energy bills for the long term, these units are also easier to install than ducted systems, as they require less modifications to your home. Less intrusive – The indoor units of split systems are designed to be as compact as possible, so they'll have a minimal impact on your home. Their quiet operation makes them suitable for use in bedrooms and working areas. Cleaner air – Most systems also purify the air while cooling, reducing dust and allergens in your surroundings to improve indoor air quality (IAQ). Easy to maintain – Once the system has been installed, it's easy to clean the filters and keep it in good working order. The product will also be covered by a manufacturer's warranty if anything goes wrong. Split system air conditioning systems are split into two components – an outdoor unit that contains the compressor, and an indoor unit, which may be wall-mounted or floor-standing or ceiling cassette type which contain the fan and evaporator. Like other air conditioners, split systems use refrigerated cooling to remove the heat from the air inside your home, it will then transfer out the heat through the refrigerant lines and disperse it through the condenser coil. The air in the room is cooled by a cooled refrigerant and circulated around the indoor space by the fan. Split systems come in a range of options, depending on how much cooling you need, how much space you have available and whether you need heating as well as cooling. You can also look for advanced features such as humidity control and Wi-Fi compatibility to get even more out of your new air conditioner. 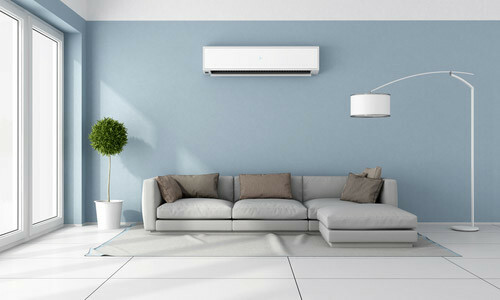 Wall-mounted air conditioners are the most popular choice for Australian homes. These compact units are usually installed high on the wall and have sleek, modern designs that blend in with contemporary decor. Their quiet operation makes them ideal for bedrooms, study areas and offices. If you're short on space, or you want to make use of an existing fireplace or alcove, floor-standing units could be more convenient than high wall-mounted units. These usually direct air upwards rather than down, and because they're within easy reach, it's even easier to keep them clean and change the filter. If you don't have enough space on your walls for a wall-mounted or floor-standing unit, or you just prefer a centrally located unit for a larger space such as an open plan apartment or boardroom, a ceiling cassette can be a great alternative. These compact units take up less space than a ducted system, and their quiet operation means you won't even notice they're there. If you need to cool multiple rooms, a multi-split system lets you maintain unique climates in different areas, all through a single compressor. Two or more indoor units can be connected to the same outdoor unit to save space and improve convenience. Want to know more about split system installation in Sydney? Get in touch with Maxim. We can help you choose the best solution for your home, workplace or project.